August is such a budget crunch for us after having lots of summer fun and preparing for the upcoming school year. Therefore, I decided to make August the month of giveaways, giving you all multiple chances to win extra cash or giveaways. 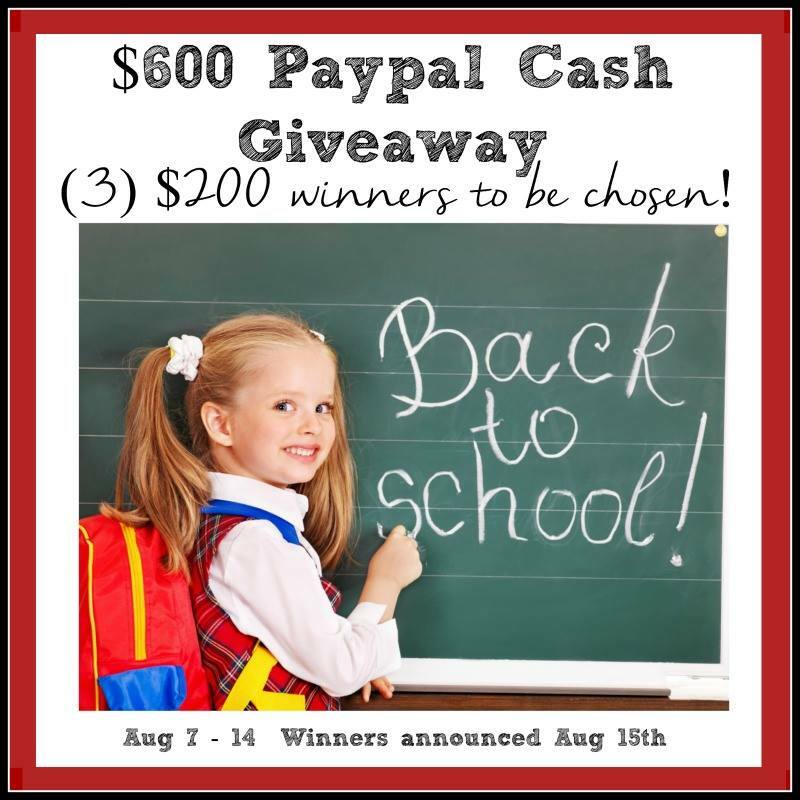 This time we are running a Back to School PayPal Cash Giveaway – 3 winners will get $200 in cash! How awesome is that? The only mandatory thing you have to do to enter the giveaway is leave a comment letting me know what you would do if you won the giveaway. Then, you have up to 60+ more chances to enter by simply liking and following all of the participating blogs. The giveaway is open TODAY (Aug 7th) and ends Aug 14th at 8pm. Winners will be announced Aug 15th and funds will be sent via PayPal as soon as everyone has been notified! *Please note, Facebook and/or Pinterest do not have anything to do with this giveaway, nor do they endorse it in any way. No purchase is necessary, and following or liking the blogs only offers extra chances to win. It is not mandatory. I’d buy my older son school clothes since he’s growing out of everything! Of course, tennis shoes! He needs tennis shoes! I would probably use it for books and toys. Thanks for the giveaway! I would use this for some school supplies and clothes for my girls. I would use it for back to school shopping for the kids. I would use the money for more clothing/shoes for my granddaughters that live with me. I would probably buy clothes and movies. I would buy canning supplies and books. I would spend it on school shopping for my daughter. I would put it towards textbooks! I would use it for a mandoline and canning supplies. I’d use it for a new tablet for a new school year! I would use it for early Christmas shopping. I would spend it on back to school clothes for my daughters. I would save it for a little while to buy my kids new winter coats and some winter clothing. My daughter needs schools supplies and clothes…can we say SHOPPING SPREE?